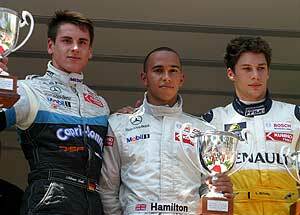 Lewis Hamilton (ASM F3, Dallara-Mercedes) is the winner of the seventh round of the 2005 Formula 3 Euro Series Season, held as support race of the Monaco F1 Grand Prix. The McLaren-Mercedes protégé crossed the line 1.777 seconds ahead of his team-mate, Adrian Sutil (ASM F3, Dallara-Mercedes), with Loïc Duval (Signature-Plus, Dallara-Opel) finishing third in the 18-lap race at the narrow and twisting 3.340-kilometre circuit de la Principauté. The battle for the win in the Formula 3 Euro Series inaugural Monaco race was virtually over right at the start when Hamilton made use of his pole position to take the lead. His team-mate, Adrian Sutil, followed close behind, but there was just no opportunity of passing the Briton. In lap seven, the Safety-Car had to come out as Thomas Holzer (AM-Holzer Rennsport, Dallara-Opel) had skidded into the crash barriers after exiting the Swimming pool chicane. In lap nine, the race was restarted and Hamilton controlled the field to take his fifth win in 2005 and the sixth in his Formula 3 Euros Series career. Behind the Signature-Plus team-mates  Loïc Duval and James Rossiter (Dallara-Opel)  Franck Perera (Prema Powerteam, Dallara-Opel) secured fifth place, with Fabio Carbone (Signature, SLC R1-Opel) finishing sixth. Maximilian Götz (HBR Motorsport, Dallara-Opel) was penalised with a drive-thru penalty for a jump-start, thus losing his chance of scoring points. At the end of the 18 laps, he had to settle for 15th place.